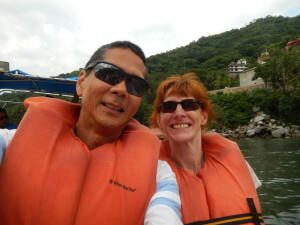 Wednesday was our final day at a port (Puerto Vallarta). This would be our best day yet! Prior to the cruise when we first started looking into possible excursions, we were concerned about Jeri’s back and thus we were hesitant to try zip lining and rappelling. Early in the cruise, after talking with some people at the excursion desk, we decided to sign up for it. We’re so glad that did! We got ready and got off of our ship. 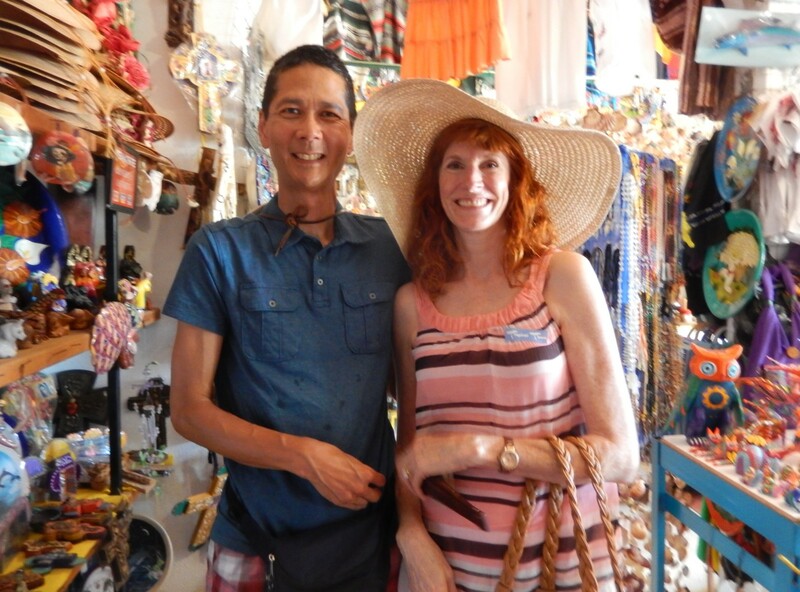 Because we had almost an hour prior to departure, we had time to visit a shopping area close by. 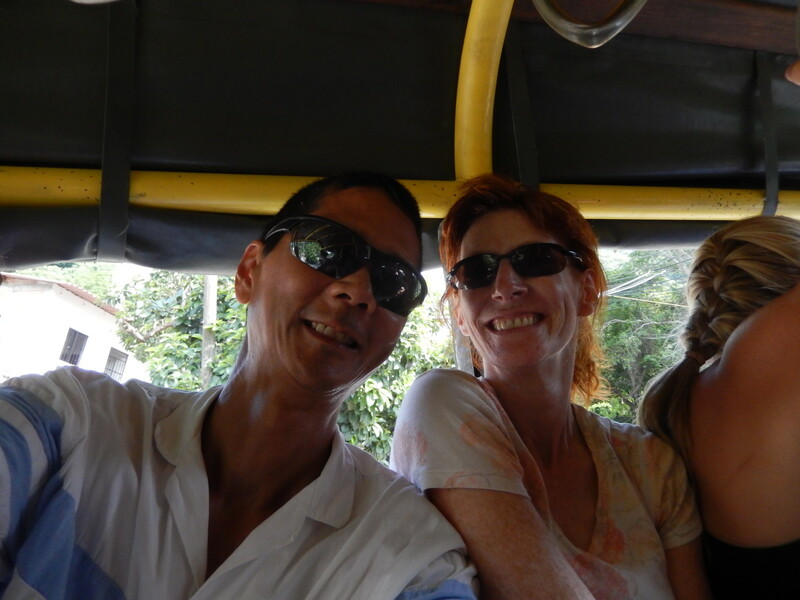 Fortunately a local told us about golf carts that shuttled back and forth. 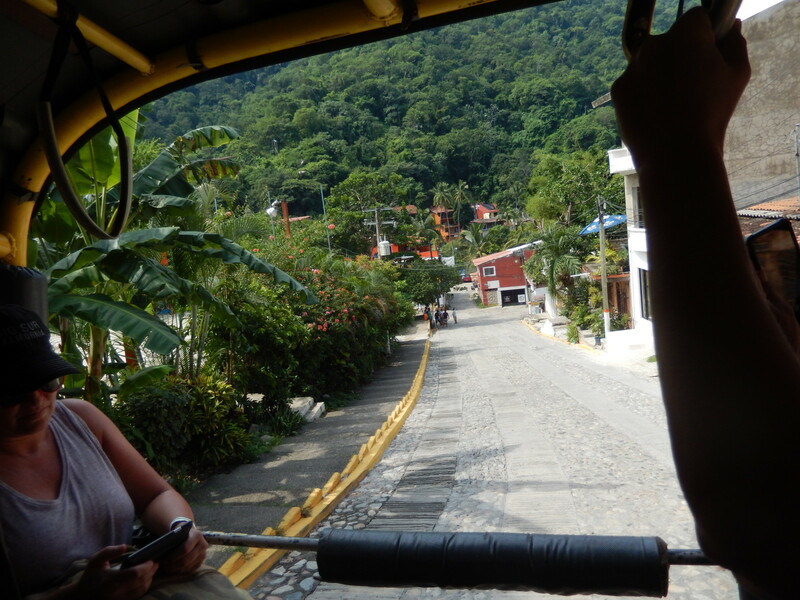 So we easily saved ourselves a 10-plus minute walk (each way) by hopping on a golf cart. Shopping in these little stores in Mexico is fun because it’s easy to find neat stuff at good prices. 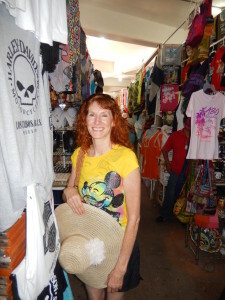 Shopping in Puerto Vallarta. Click photo for full size. 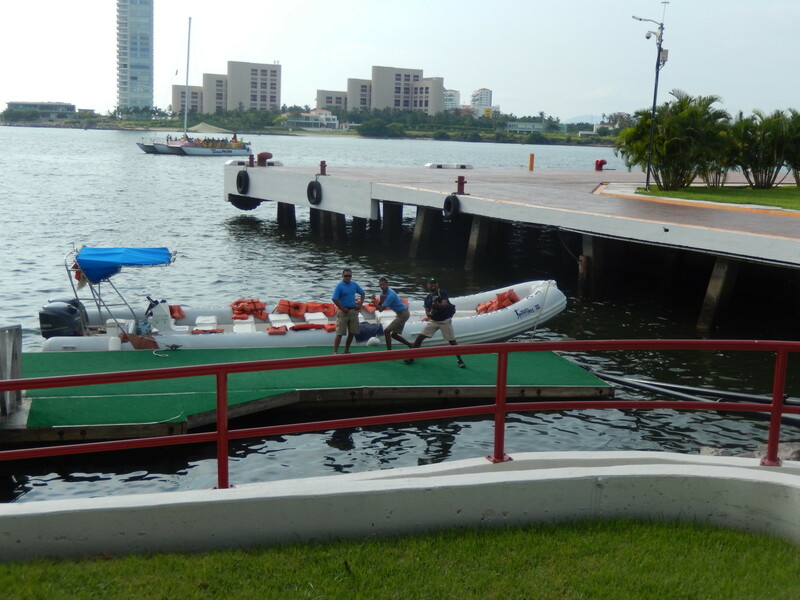 After shopping, we were able to hop on another golf cart back to the ship where we would gather for our excursion. Traveling by Golf Cart Back to Our Ship. Click photo for full size. Our excursion started with a boat ride to a location south of Puerto Vallarta. Then we boarded the back of a truck, fastened our belts, and held on as we traveled up the mountains to our base camp. 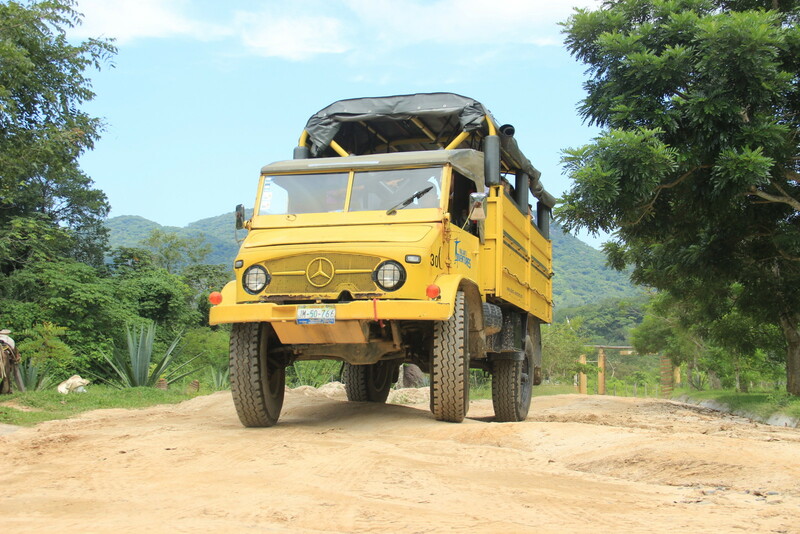 The last part of the journey was on unpaved roads. Looking Out the Back of the Truck as We Traveled. Click photo for full size. A Look Over the Front of the Truck. Click photo for full size. In the Back of the Truck. Click photo for full size. Back of the Truck. Click photo for full size. The trip started on paved roads but ended on up on dirt roads. We were held on tight as we were bounced and tossed about. Truck that Took Us to the Base Camp. Click photo for full size. At the camp, we changed clothes and put on our gear. 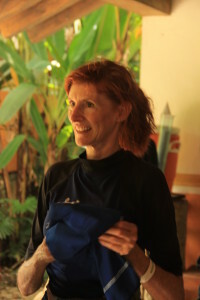 Jeri Getting Suited Up. Click photo for full size. 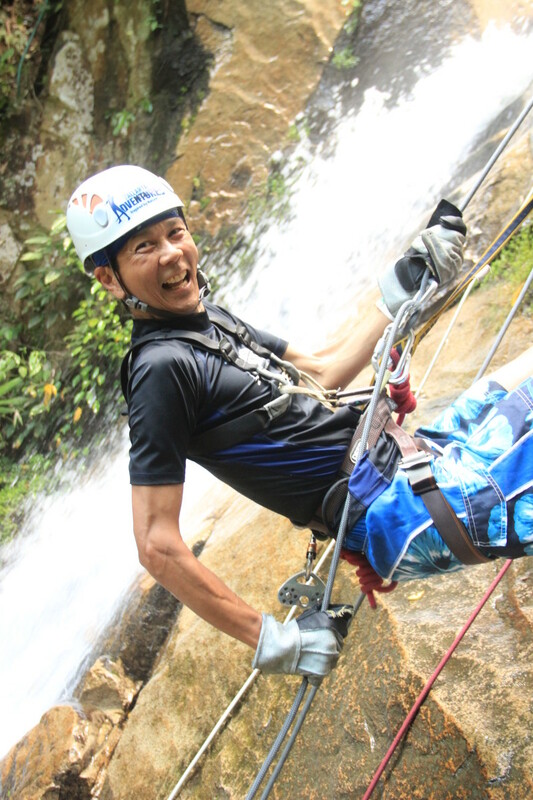 With Our Rappelling Harness. Click photo for full size. First stop was an orientation session. Tim Walking to the Orientation Session. Click photo for full size. Jeri Walking to the Orientation Session. Click photo for full size. 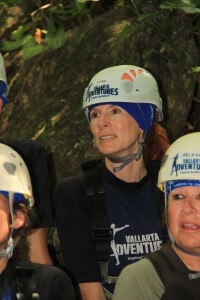 Jeri Listening to the Orientation. Click photo for full size. Tim Listening to the Orientation. Click photo for full size. We posed in front of the truck. Posing in Front of the Truck. Click photo for full size. Then we were assigned a burro. This was our first time riding an animal! 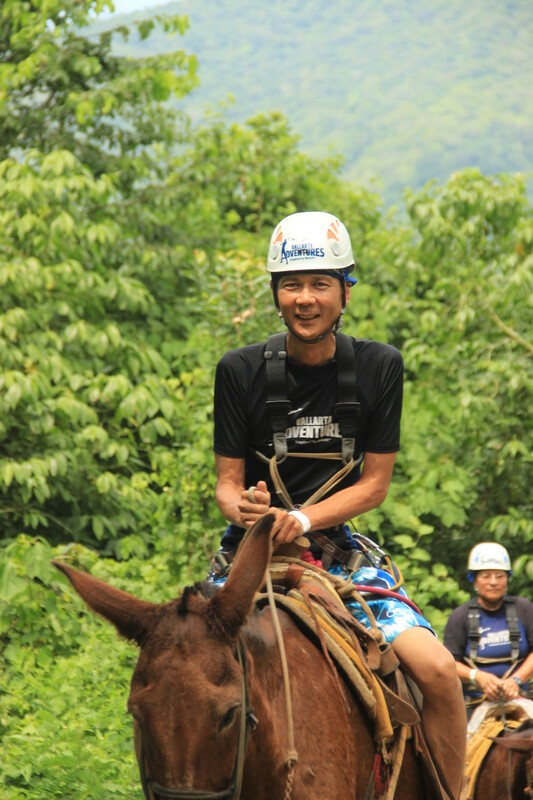 These burros were quite strong and sure-footed carrying us farther up the mountain. Tim on His Burro. Click photo for full size. 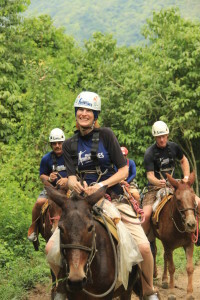 Jeri on Her Burro. Click photo for full size. 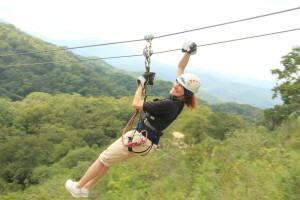 Once at the top, we hiked a short distance to the first zip line. 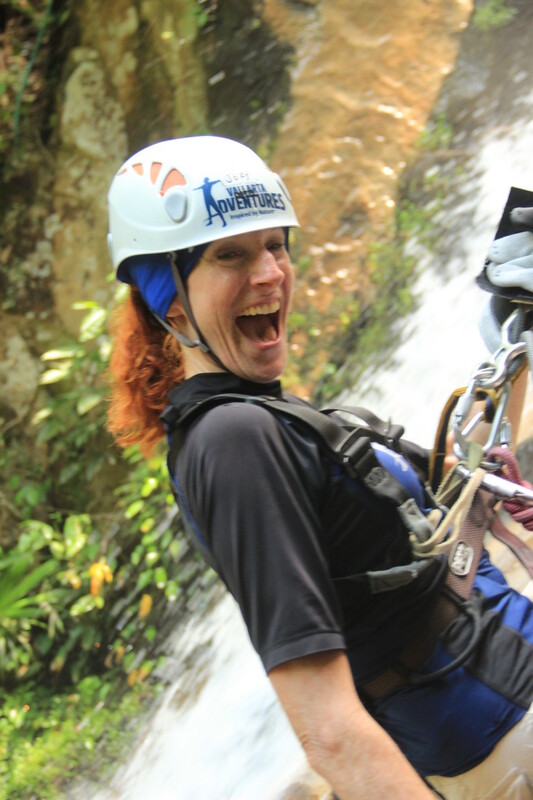 Jeri went first. 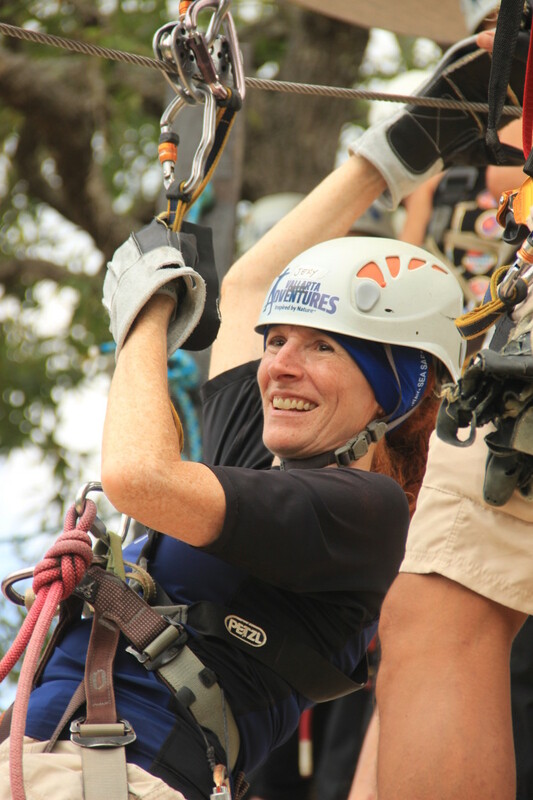 Jeri Ready for Her First Zip. Click photo for full size. Jeri Zips Down the First Zip Line. Click photo for full size. 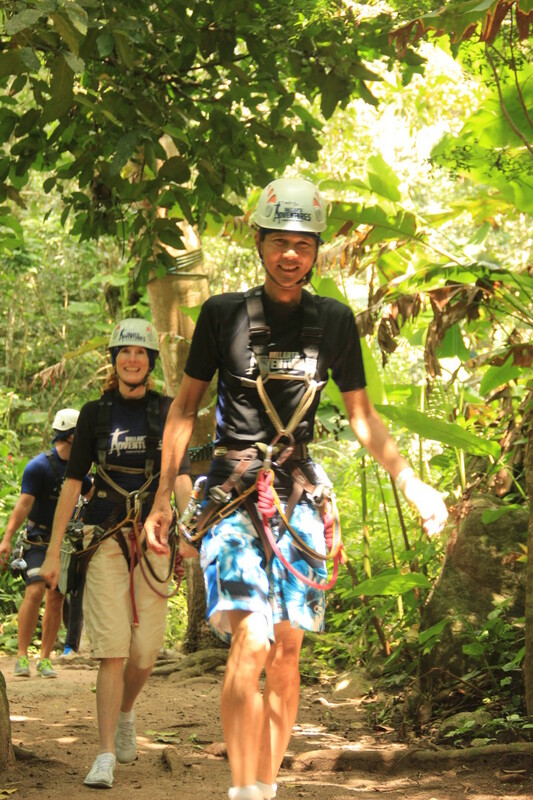 Tim Prepares for His First Zip. Click photo for full size. 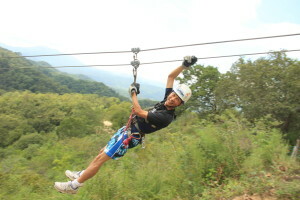 Tim Zips Down His First Zip Line. Click photo for full size. 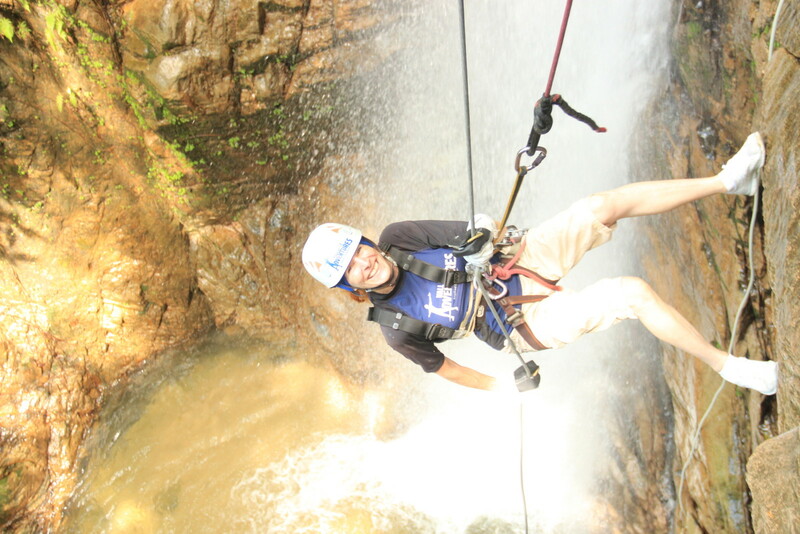 After a couple of zip lines, we rappelled down besides a waterfall. The scenery was beautiful! 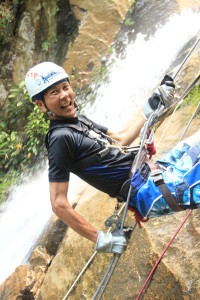 Jeri Rappels. Click photo for full size. We ended up in the pool at the bottom. Jeri Rappelling Down Next to the Waterfall. Click photo for full size. 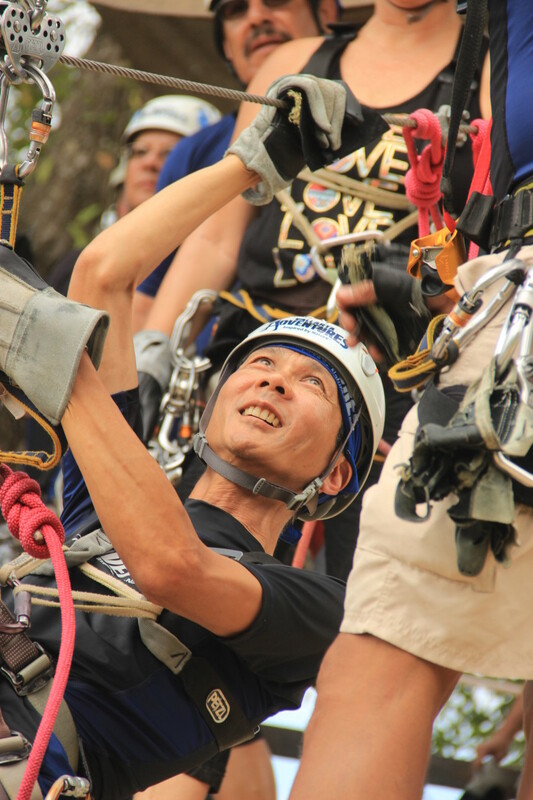 Tim Rappels. Click photo for full size. 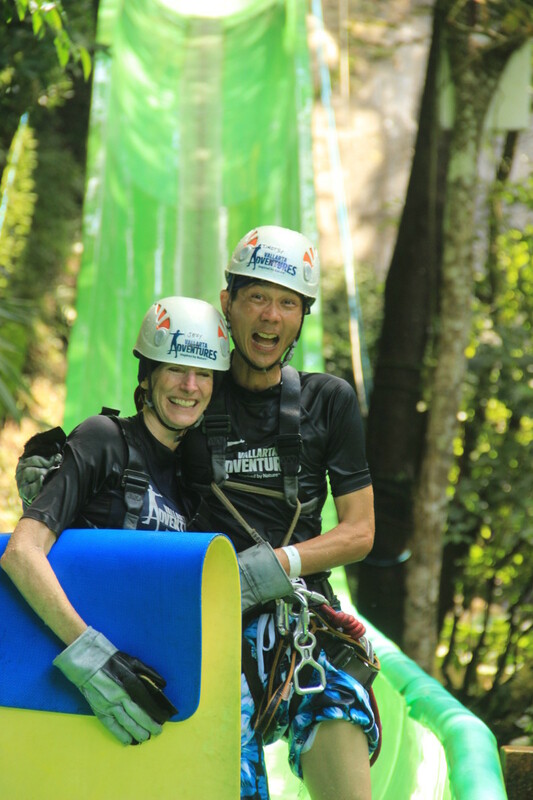 After some other zip lines, we did our first water slide. Tim sat in front; Jeri was holding on to him from behind. 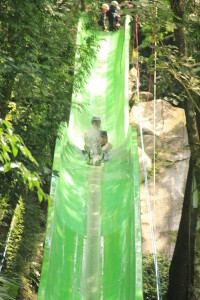 Coming Down the Water Slide. Click photo for full size. We slid down the slide right into the water. Hitting the Water. Click photo for full size. Although we got a face-full of water, we thought it was hilarious and were laughing so hard. 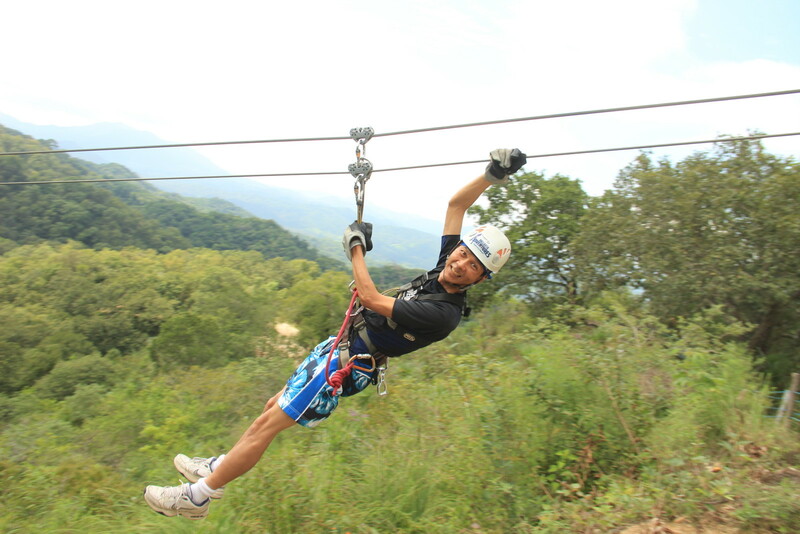 Coming Up for Air. Click photo for full size. Having a Good Laugh. Click photo for full size. Now we were thoroughly soaked. Thoroughly Soaked. Click photo for full size. Towards the end, we did one zip line upside down. 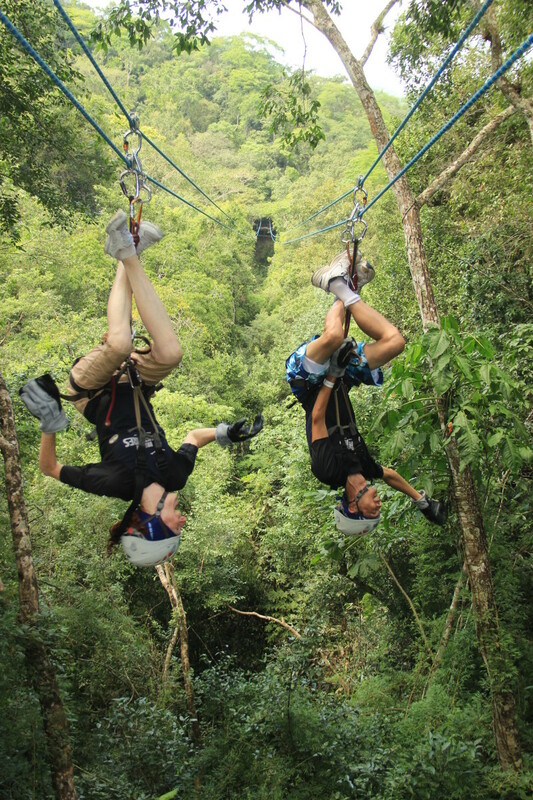 Ziplining Upside Down. Click photo for full size. Eventually we end up back at the base camp. We picked out our photos. 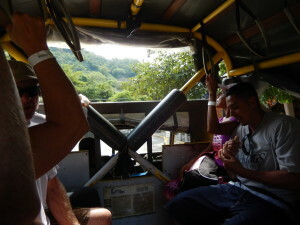 Then we hopped back on the truck for a ride back to the dock. Leaving the Dock. Click photo for full size. 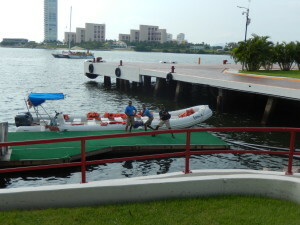 We take the boat back to the port where our cruise ship was docked. Returning Back to Port. Click photo for full size. Passing by the Crown Princess. Click photo for full size. The guys that took care of us were great. Here they are hamming it up. Looking Back at the Boat and our Crazy Crew. Click photo for full size. We thoroughly loved the day! Tuesday was another day at sea as we sailed from Loreto to Puerto Vallarta, Mexico. In the morning, we watched the movie “Inside Out” on the top deck of the ship. We really enjoyed it. After Watching the Movie “Inside Out.” Click photo for full size. In the afternoon, we watched an episode of “Chopped” plus two biographies on the Art channel. One was on Pablo Picasso; the other was on Norman Rockwell. 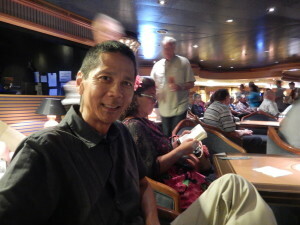 After supper, we saw a musician/comedian Steve Moris in the Explorer’s Lounge. Sometimes he had us laughing so hard that our sides would hurt! 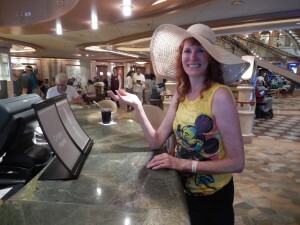 Jeri in the Explorers Lounge. Click photo for full size. Tim in the Explorers Lounge. Click photo for full size. What a day! 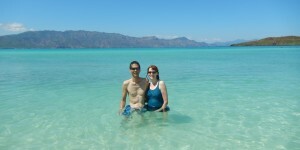 Snorkeling in Loreto was the perfect excursion! We started with a boat ride around Coronado Island. 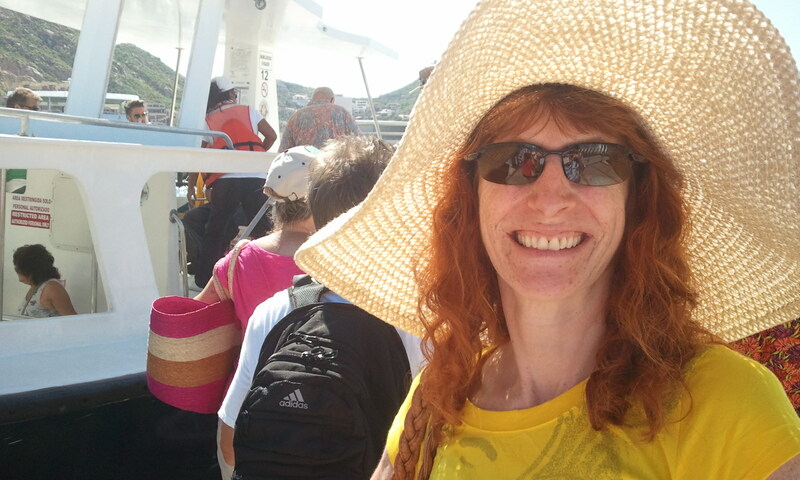 Jeri Enjoying Our Boat Ride Around Coronado Island. Click photo for full size. Tim Enjoying the Boat Ride Around Coronado Island. Click photo for full size. We saw sea lions playing. Sea Lion Playing Near the Boat. Click photo for full size. 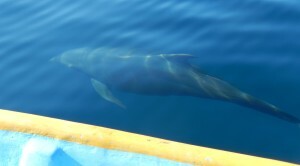 For a while, a pod of dolphins came to our boat and swam along side. 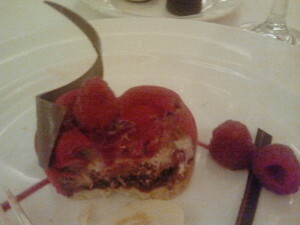 Here’s a picture of one. Dolphin Swimming Alongside of Our Boat. Click photo for full size. 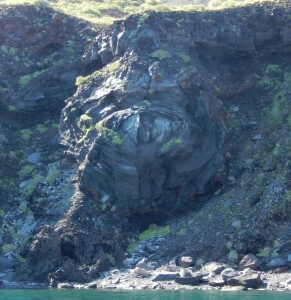 The island was formed from volcanic activity. Here is a lava tube. 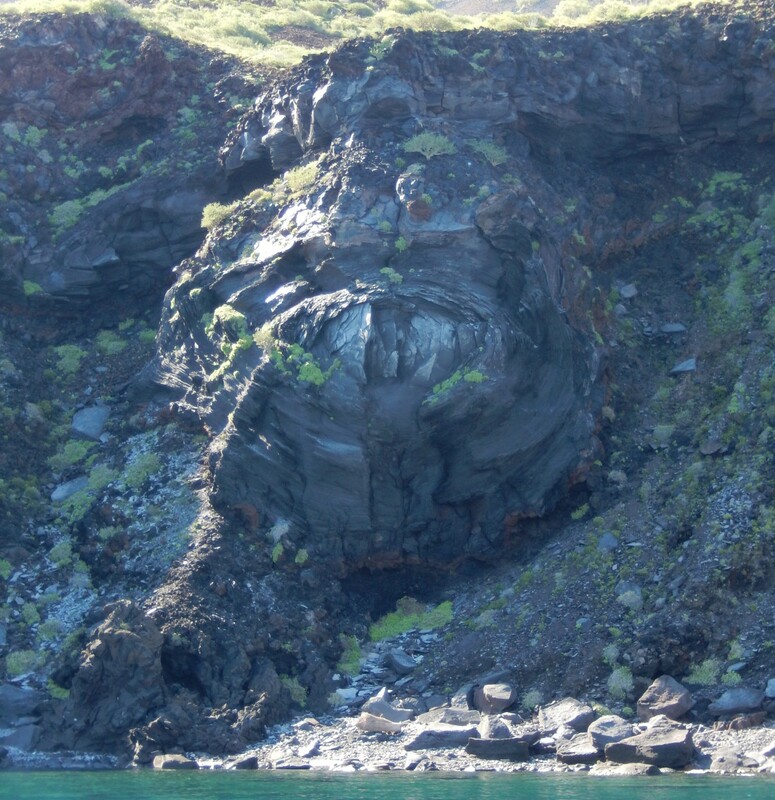 A Volcano Tube that Looks Like a Big Eye. Click photo for full size. 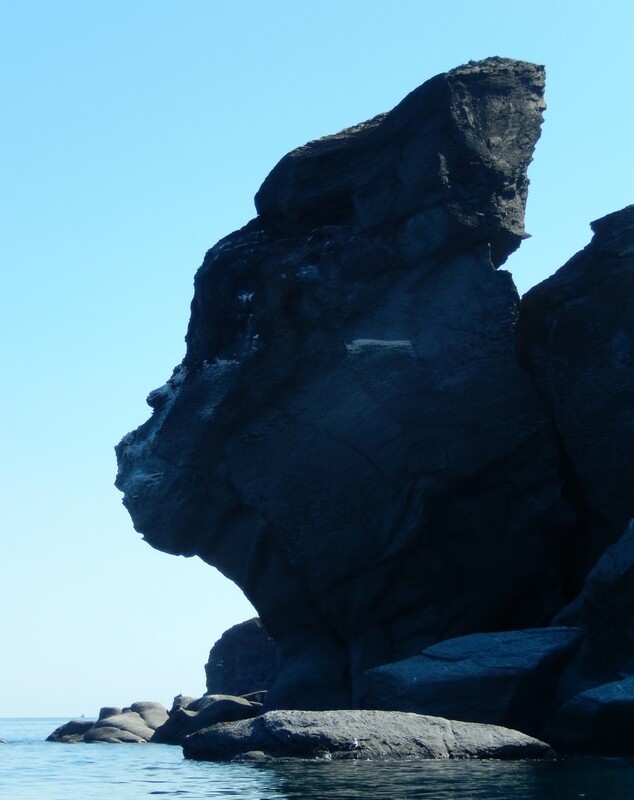 Here’s a rock formation that looks like King Kong. King Kong Rock. Click photo for full size. Unlike Saturday at Cabo San Lucas, the water was almost perfectly calm. We could see fish in the clear blue water. After an hour or so on the boat, we made it to the white, soft, sandy beach on the island. The view was idyllic–blue and turquoise water with mountains in the background. The Beautiful Beach Where We Snorkeled. Click photo for full size. 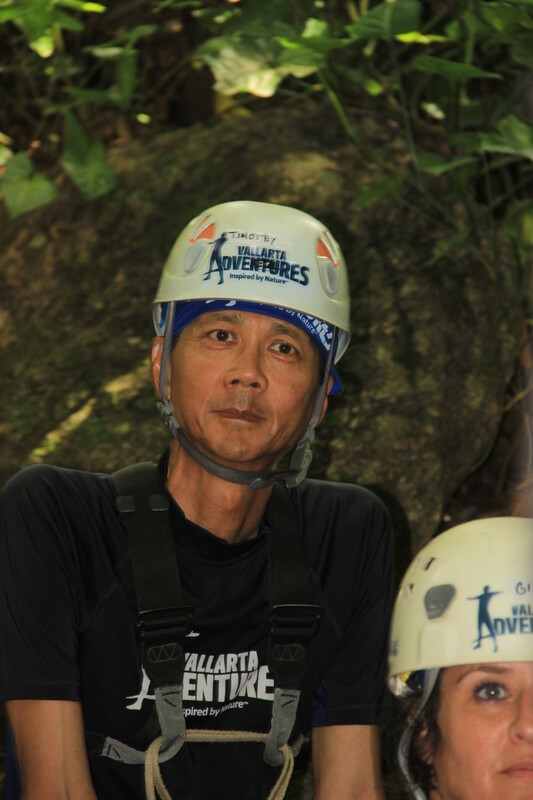 Unlike Saturday, snorkeling was so easy! We saw lots of different fish swimming among the coral. While we were around the coral, we could hear a constant crackling sound…kind of like Rice Krispies cereal but only sharper. When we took our lunch break, a fellow snorkeler told us that we were hearing the sound of coral feeding. We saw lots of different fish from tiny to some a foot or more in length. I (Tim) also saw a jellyfish that was about the size of a half dollar in diameter. We both saw a long tubular fish that was over two feet in length. 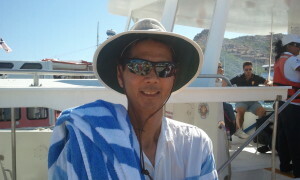 In the Water After Snorkeling. Click photo for full size. 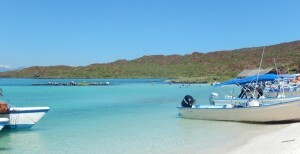 After snorkeling, we returned to Loreto. Since we still had some free time, we walked around for a while. With the Crown Princess in the Background. Click photo for full size. Jeri in Loreto. Click photo for full size. 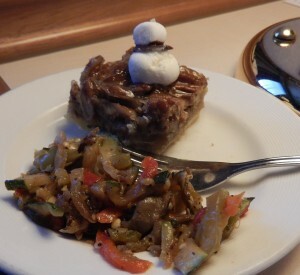 Back on the ship, Jeri ordered a specialty coffee at the International Cafe and we picked up a little snack (roasted vegetables and pecan pie). 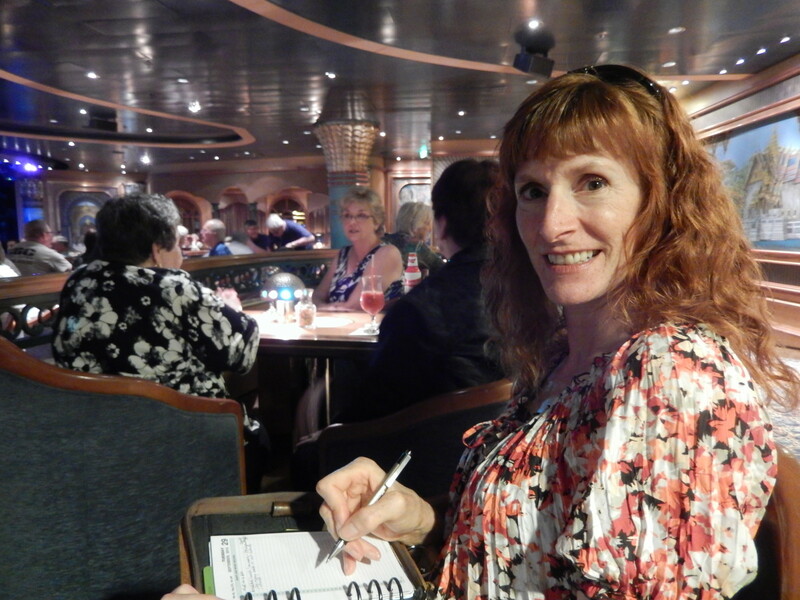 Sunday was the fifth day of our cruise. 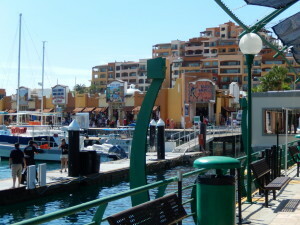 We docked at La Paz (means “the peace”). 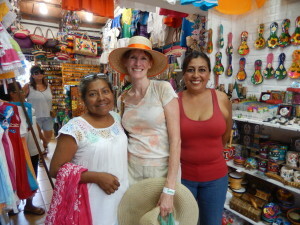 Our excursion for the day was a bus trip and tour of Todos Santos (“All Saints”), a town on the other (i.e. 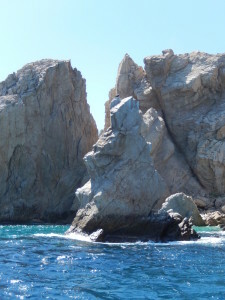 Pacific) side of the Baja peninsula. 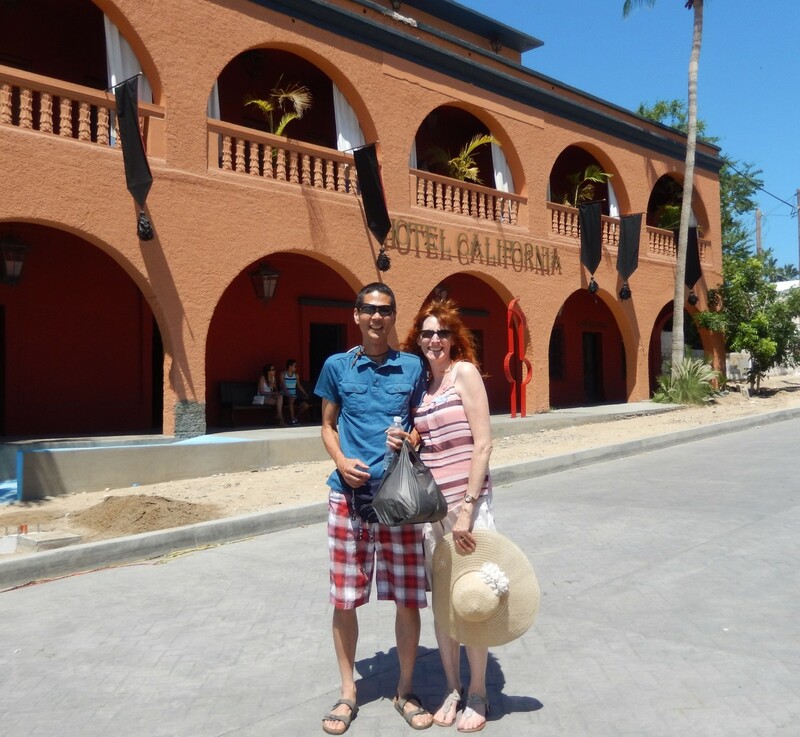 We boarded a tour bus and drove about over an hour to Todos Santos. 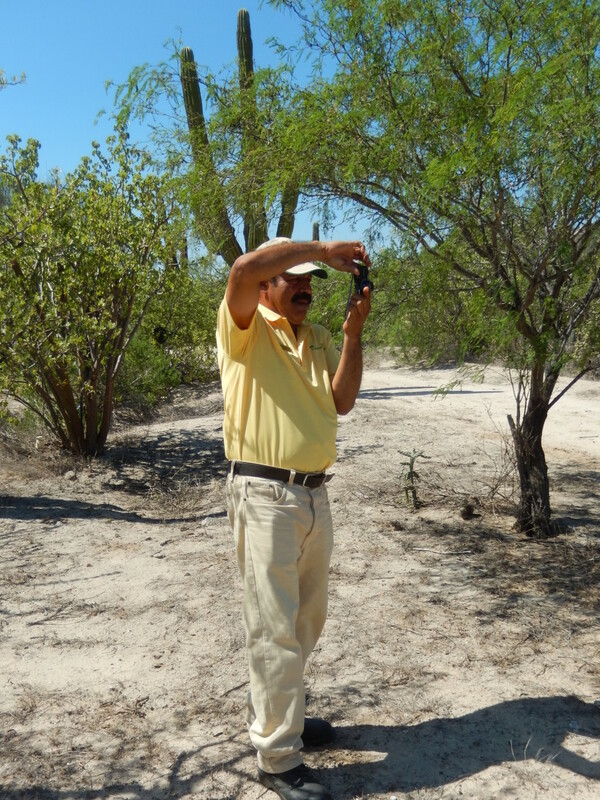 Our guide, Guillermo, was entertaining and interesting. 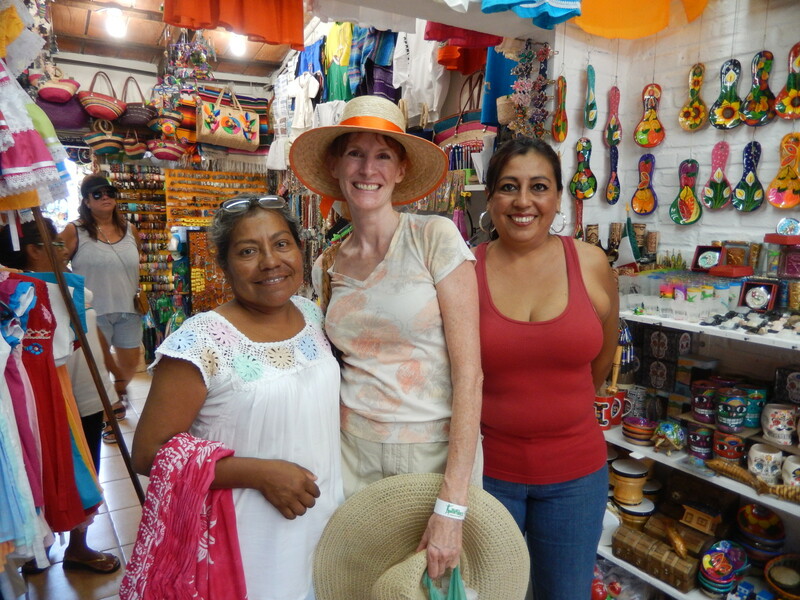 We learned some Mexican history and toured the small town. 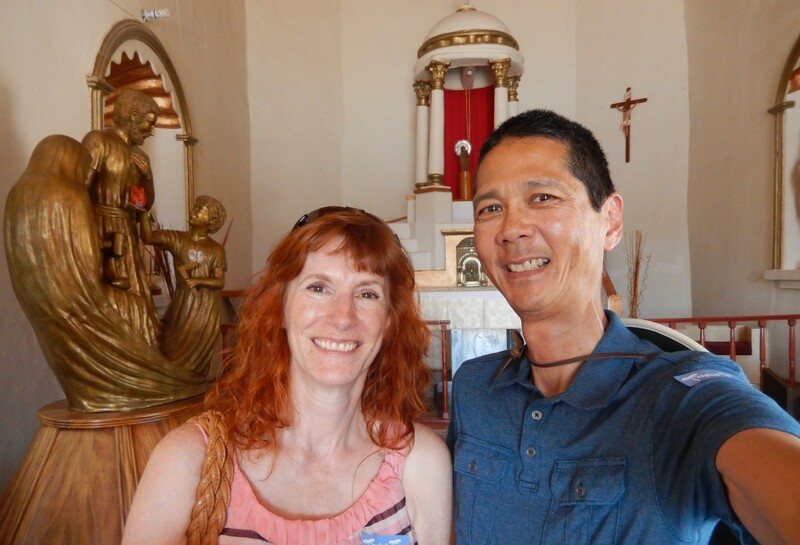 Here we are at the mission. 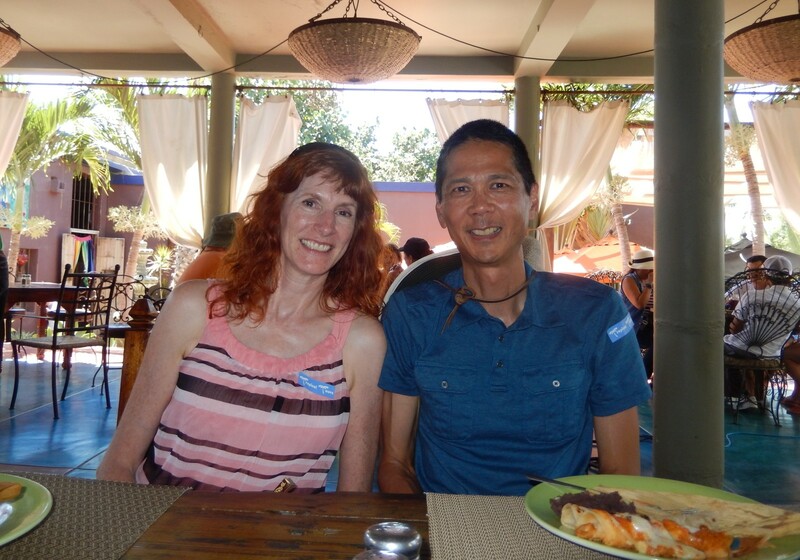 Jeri and Tim in the Mission in Todos Santos. Click photo for full size. We found some fun places to shop. The town is known for its artist community. 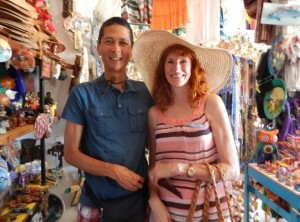 Tim and Jeri Shopping in Todos Santos. Click photo for full size. 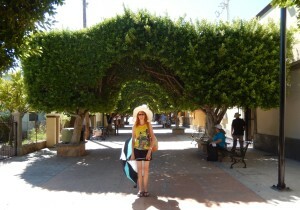 We had lunch at The Hotel California which may (or may not) be the source for the song by the Eagles back in the 70s. Lunch at the Hotel California. Click on photo for full size. 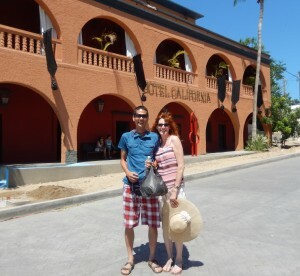 Tim and Jeri Outside of the Hotel California. Click photo for full size. 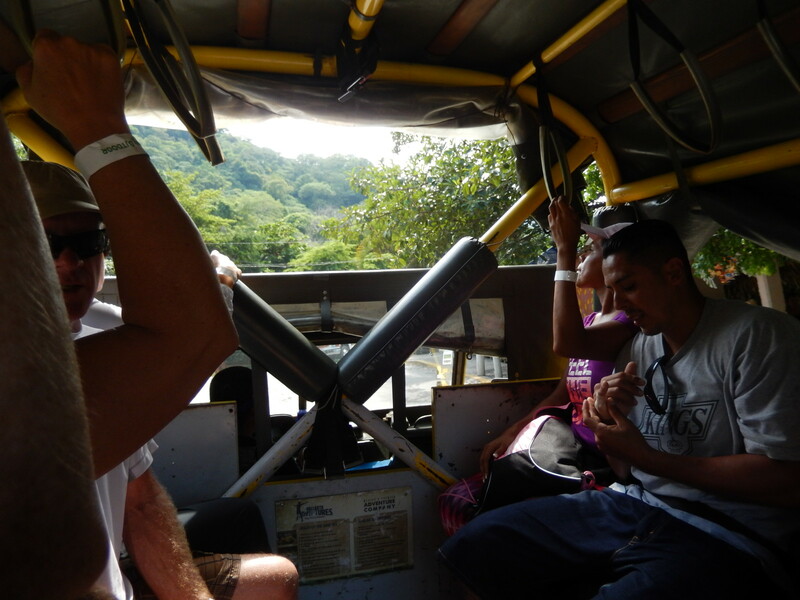 On the bus ride back, Guillermo shared about one of his loves, cacti. We stopped for some pictures next to the cardón cactus (relative of the saguaro). They are among the world’s tallest with some growing up to 70 feet tall. 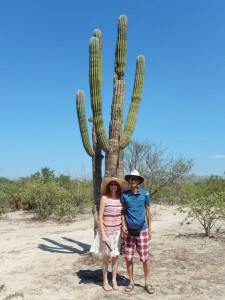 Standing Next to a Cardon Cactus. Click photo for full size. Guillermo, Our Tour Guide Helping Take Photos. Click photo for full size. 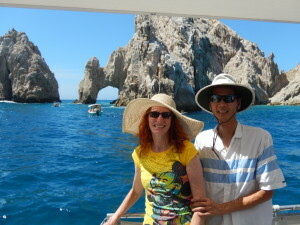 Jeri and I (Tim) woke up Saturday morning expecting to be in Cabo San Lucas, Mexico. 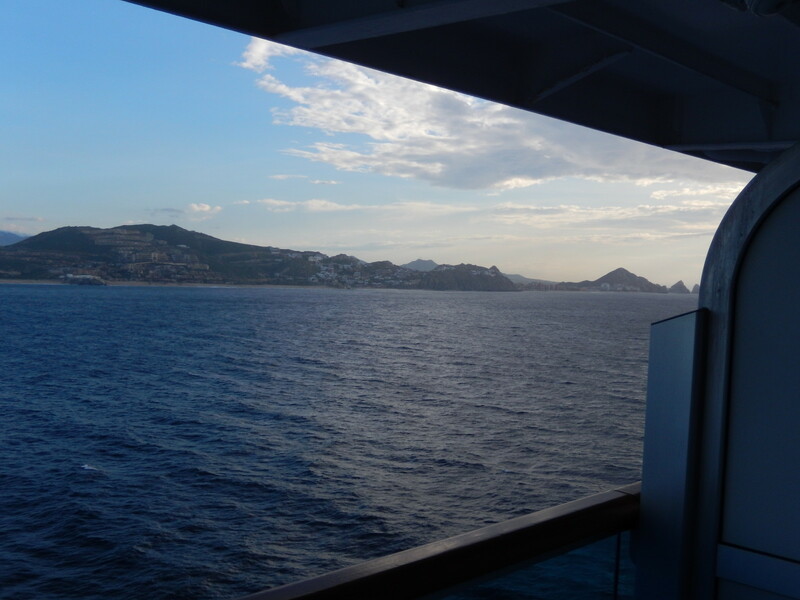 Instead we were treated to the sight of watching us approach Cabo. 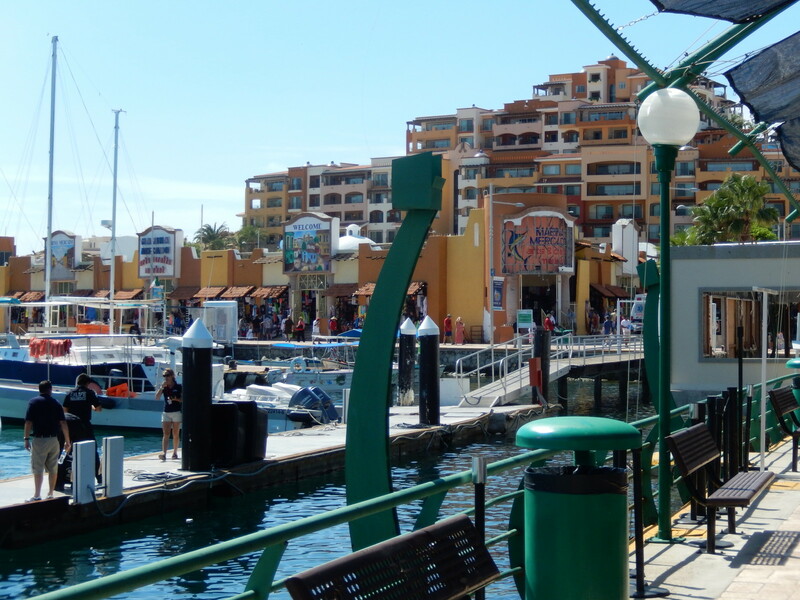 Cabo San Lucas is at the southern-most tip of the Baja California Peninsula. At the very tip is a rock formation called El Arco (or the Arch). We sailed right past it. 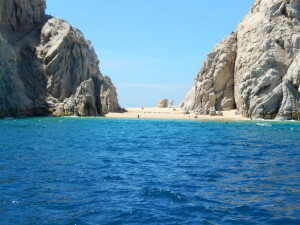 Pacific Ocean Side of Cabo San Lucas. Click photo for full size. Jeri and Tim Viewing Our Approach to Cabo San Lucas. Click photo for full size. After swinging past the tip, the ship came up to Cabo. The captain dropped anchor and announced that because the swells were fairly large (around four or five feet) that the tenders (boats to take us to shore) would be delayed a bit. The day before, Jeri and I signed up for a snorkeling excursion at Cabo San Lucas. After gathering our stuff and checking the checklist multiple times, we headed down to the tenders (which were now running). A View from the Cabo Pier. Click photo for full size. Jeri Shopping in Cabo. Click photo for full size. 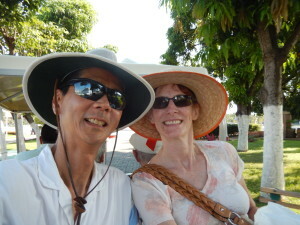 We headed back to the pier to meet up for our excursion. 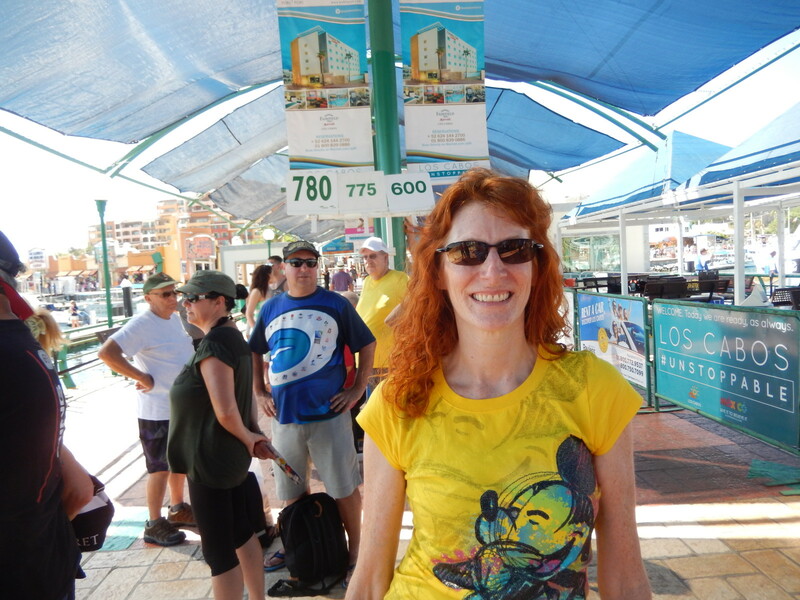 Jeri Waiting for our First Excursion. Click photo for full size. We got on the catamaran and headed out on the rough waters. First we headed out towards the famous El Arco (the Arch). On the way, we saw Lover’s Beach and Neptune’s Finger. Lover’s Beach. Click photo for full size. Neptune’s Finger. Click photo for full size. Here we are in front of El Arco. 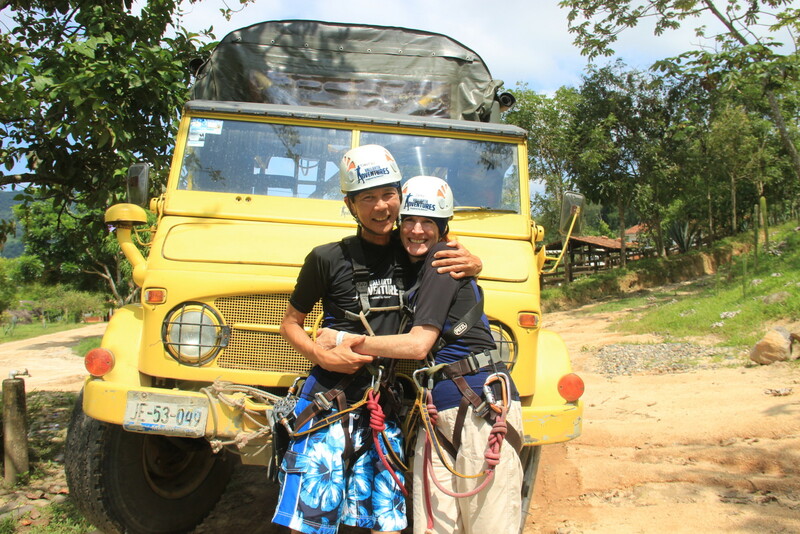 Jeri and Tim in Front of El Arco. Click photo for full size. 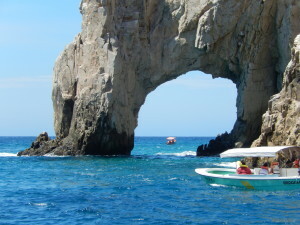 El Arco. Click photo for full size. A View Through El Arco. Click photo for full size. We continued sailing to the snorkel site. Due to the high swells, the ride was very rough. 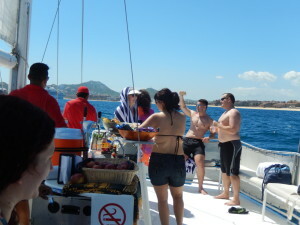 Several people on the boat got sea sick (and lost their breakfasts in trash bags). Towards the end, I (Tim) started feeling a bit nauseated. 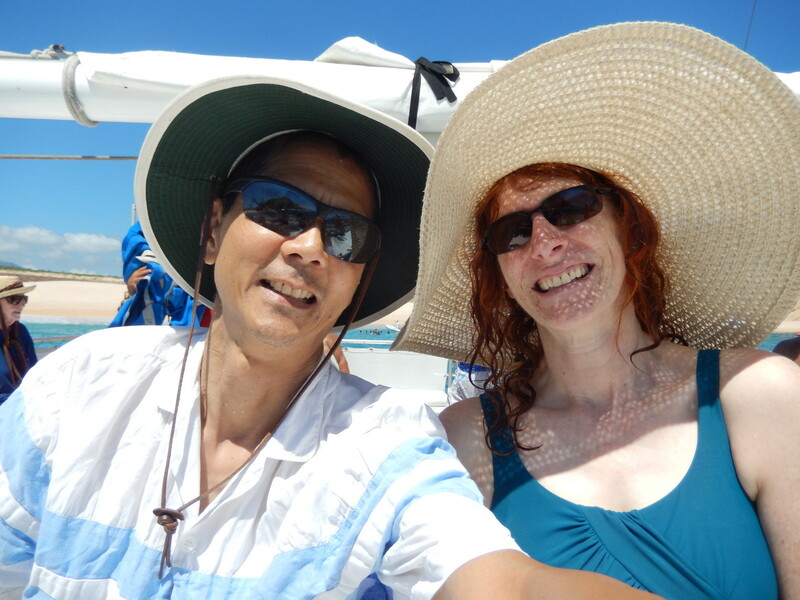 Tim and Jeri on the Catamaran Heading Out to Snorkel. Click photo for full size. 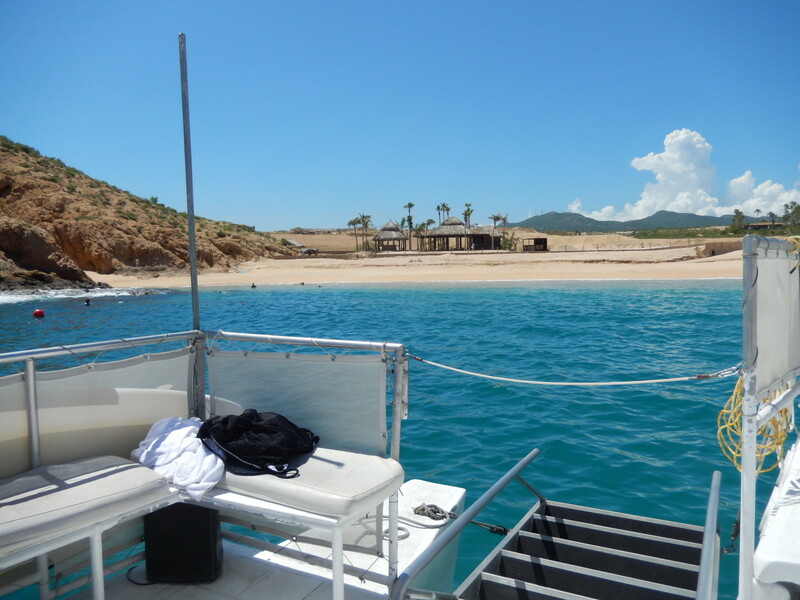 Here’s where we snorkeled. You can’t tell from the picture but the swells were still coming in and the boat was rocking back and forth. Area Where We Snorkeled. Click photo for full size. Finally we drop anchor. We put on our equipment and got in the water. But even in the water, the large swells kept on coming. 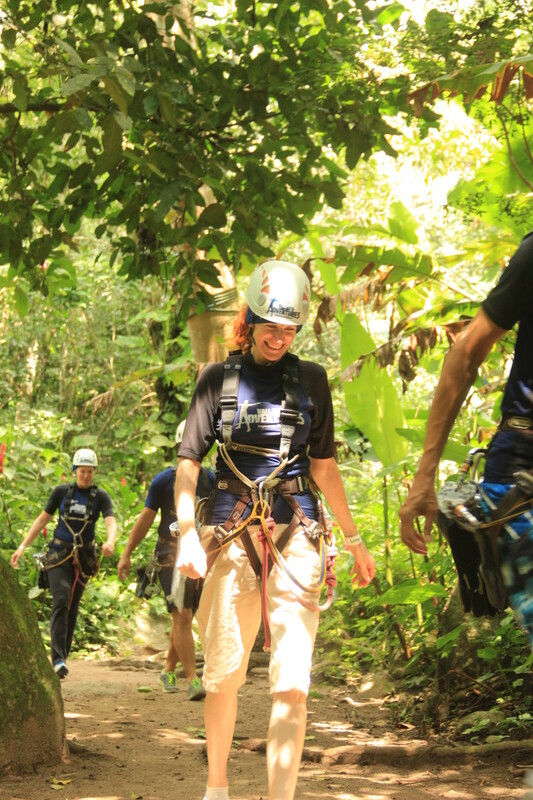 So we were going up and down. 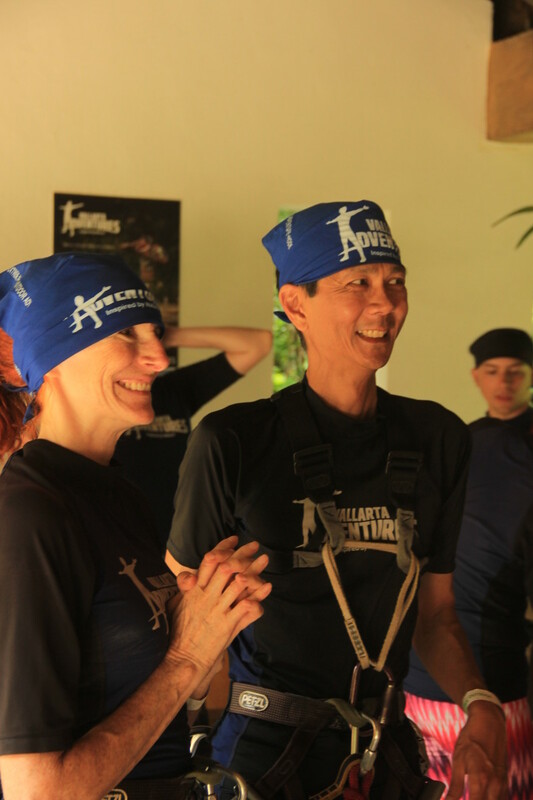 We were both new to snorkeling and Jeri had trouble with hers. So we decided to head to shore. That was no easy task. As we started to get close to the shore, the large waves would knock us down. And then the strong undertow would pull us back out to sea. 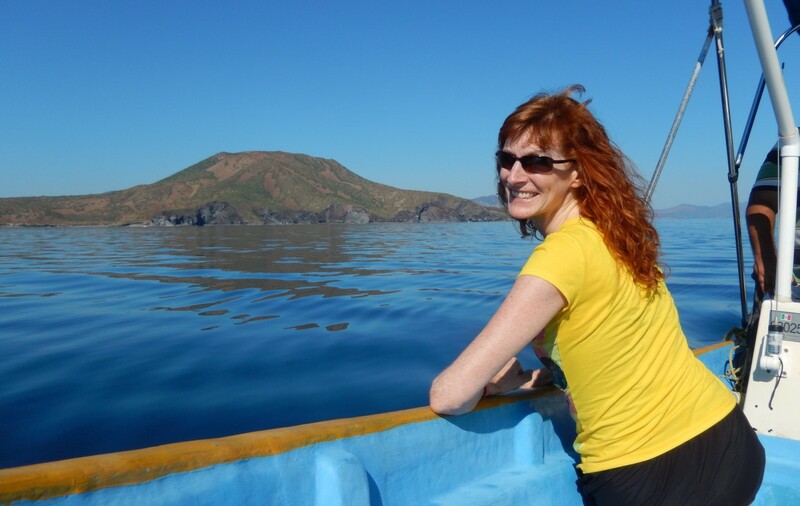 Every time that Jeri thought “I’ll stand up and get to shore this time,” another wave would wash over her and pull her back out a ways. Although Tim was worried as he saw her tumbling in the waves, Jeri thought it was so funny and couldn’t stop laughing…which only perpetuated the problem. Finally we each got close enough that we could crawl up to shore. The waves now began propelling us forward which was painful as the beach consisted of tiny sharp rocks (instead of sand). On shore, we got our first break from all of the rocking and rolling of the waves. Tim showed Jeri how to bite the snorkel so that she get breathe air instead of water. While sitting on the beach with the waves rolling in over us, our swimsuits and fins filled with this mini-gravel. Jeri’s swimsuit didn’t fully empty of the gravel until she got back to our room. Seeing the tropical fish was fun; so many fish were all around us. Even as we floated face down in the water, we were going up and down with the waves. After about 20 or 30 minutes, we got back in the boat and headed back. Because now we were going with the waves instead of against them, the trip back was a bit better. This time, we had the sail up and we were going with the swells instead of against them. 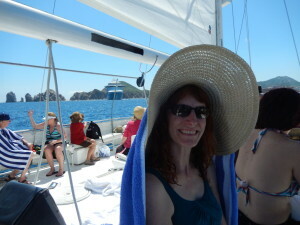 On the Catamaran Heading Back. Click photo for full size. 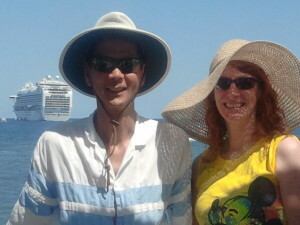 In this picture, you can see our cruise ship in the background. 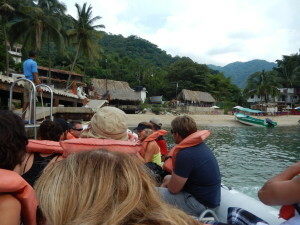 Heading Back After Snorkeling. Click photo for full size. 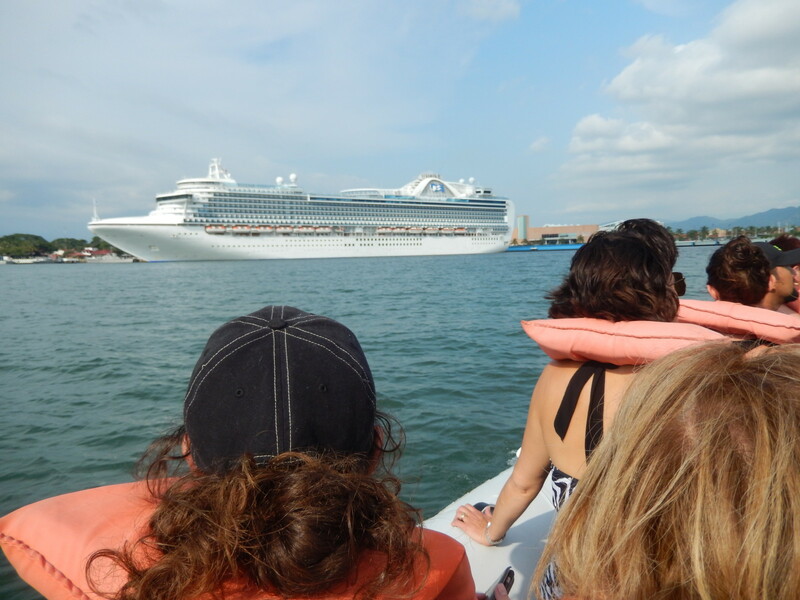 Back at the pier, we boarded our tenders and returned to the ship. Tim Ready to Get on the Tender. Click photo for full size. Jeri Ready to Board the Tender Back to the Ship. Click photo for full size. We showered and then headed down to dinner at 5:30 PM. We finished supper around 6:50 PM…just enough time to dash to the 7:00 PM show. Tonight was Jammin’ Lay Lamont. He was great! His only “prop” was a microphone. He did dozens and dozens of song imitations. He could do drum sounds, bass guitar, electric guitar (even with high distortion), and electronic keyboards. He did a great vocal imitation of many singers. We recognized a lot of the music. He also did a perfect imitation of President Obama. 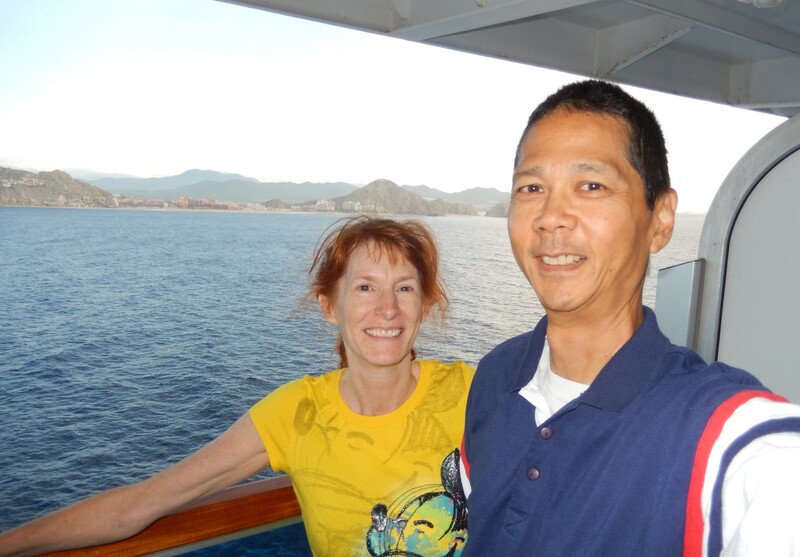 Friday was a day at sea as we sailed from San Diego down to Cabo San Lucas. 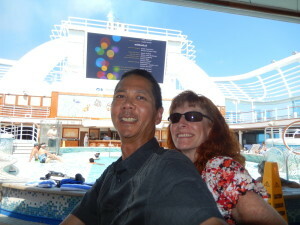 We enjoyed a relaxing day on the ship. 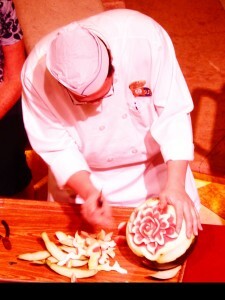 In the morning, we saw a fruit and vegetable carving demonstration. The three chefs had some outstanding creations! Carving a Watermelon into a Flower. Click photo for full size. 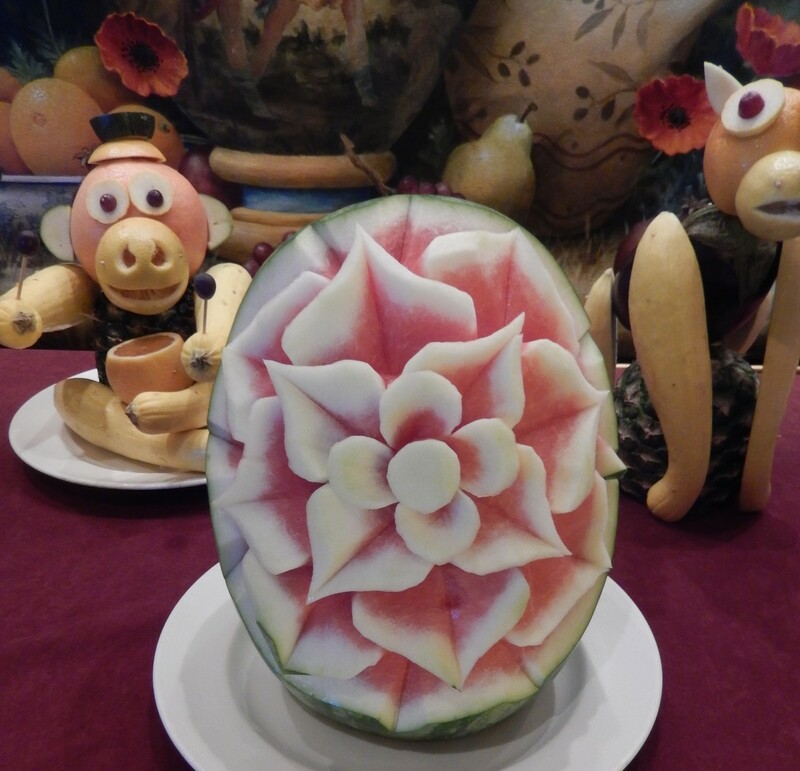 A Transformed Watermelon. Click photo for full size. 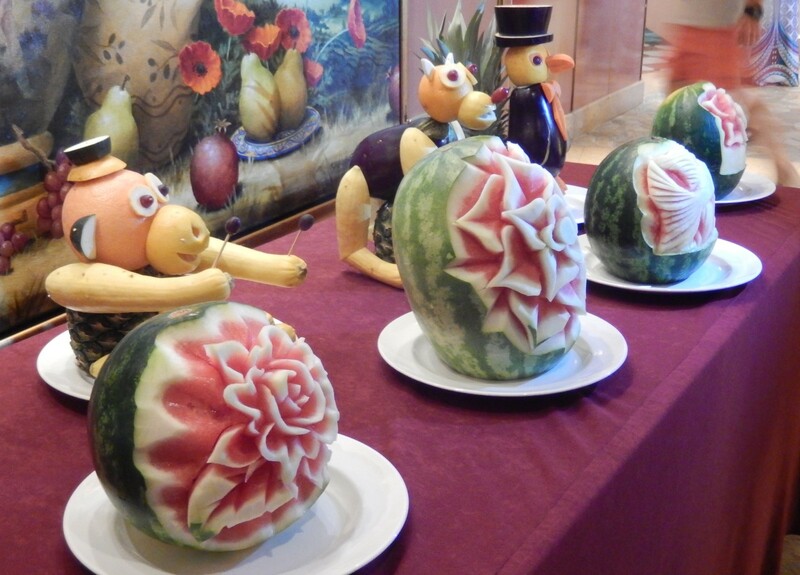 The Fruit and Vegetable Carvings. Click photo for full size. We spent some time at the tour desk and reviewing our options. 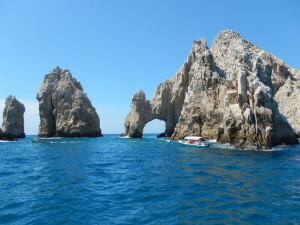 We decided to do the snorkeling tomorrow at Cabo San Lucas. 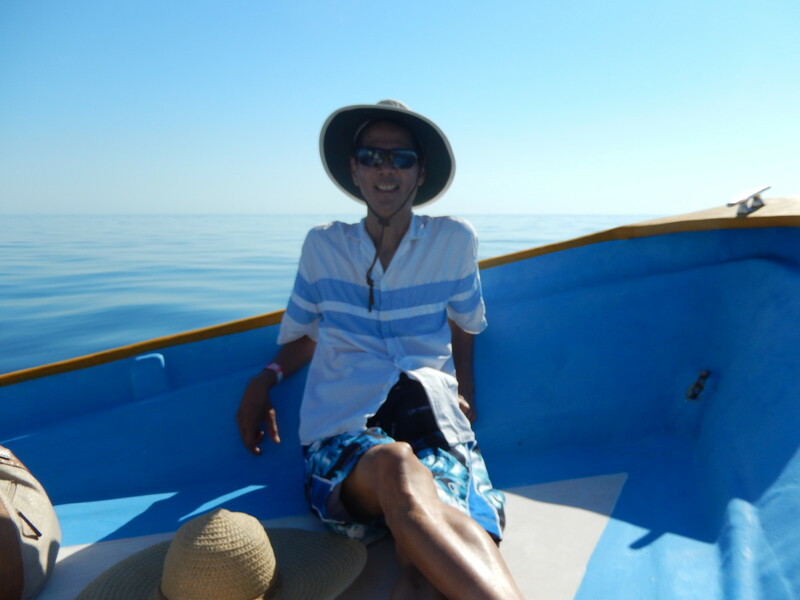 We’re hoping that we’ll like it because we also have snorkeling planned for Monday at Loreto. We also decided to do the zip-lining and rappelling adventure at Puerto Vallarta. 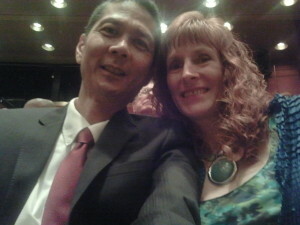 This was also our first of two formal nights. I (Tim) bought a new suit just prior to our trip. 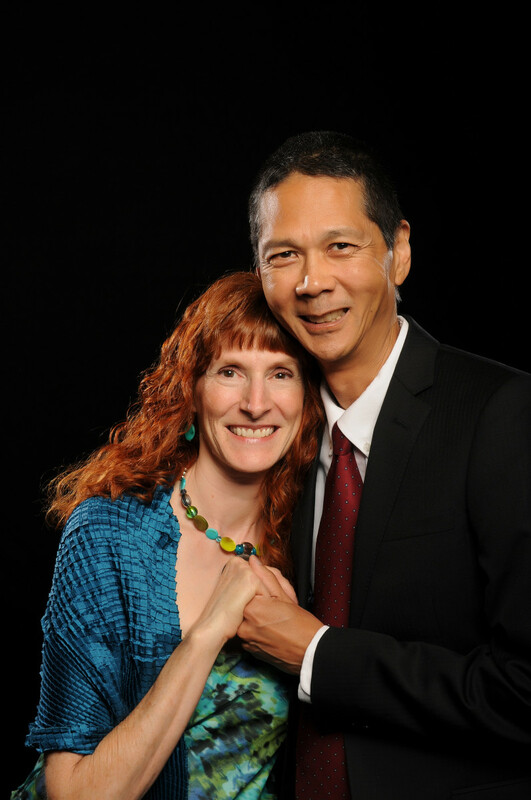 Before dinner, we got our pictures taken. We were especially pleased with two of the pictures and decided to purchase them. Formal Night Photo 1. Click photo for full size. Formal Night Photo 2. Click photo for full size. We enjoyed dressing up for a nice sit-down meal. It was fun to dress up and go out…kind of like high school prom. A couple, Will and Noreen, sat next to us so we had dinner company. The appetizer was good and the “intermezzo” was nice. 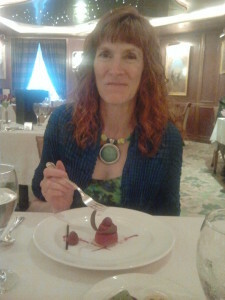 It was Blueberry Mojito Sorbet with Candied Lemon. 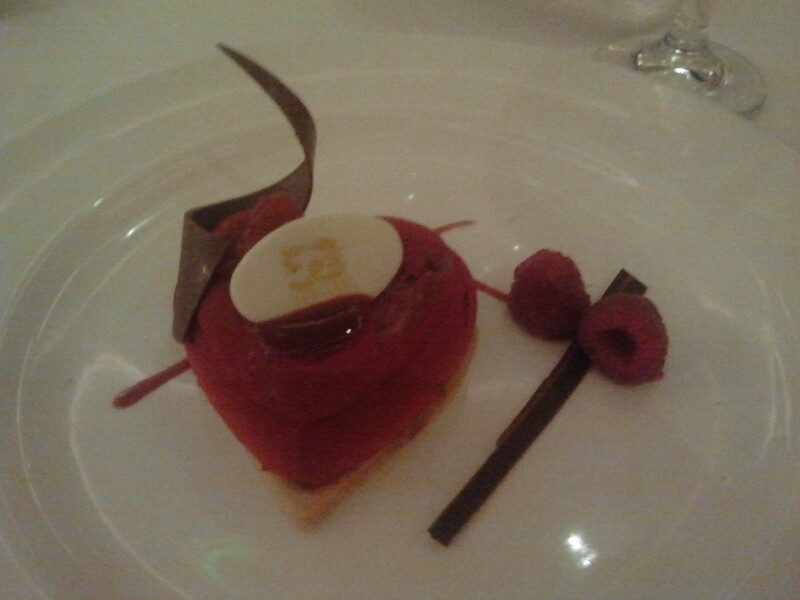 Throughout the cruise, the dessert after the evening meal was always the highlight. The lighting in the restaurant was actually quite low. A long exposure by the camera makes it appear to be bright when it actually wasn’t. Jeri Enjoying Her Dessert. Click photo for full size. 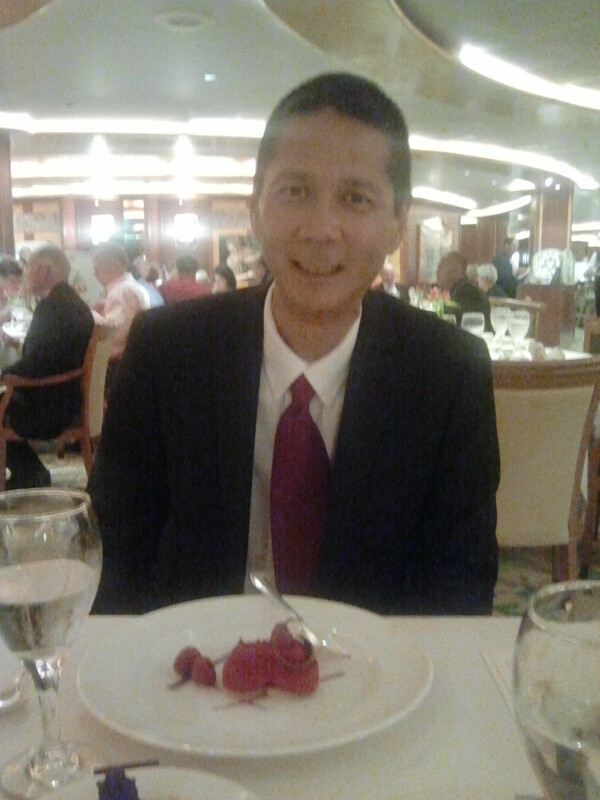 Tim Enjoying His Dessert. Click photo for full size. 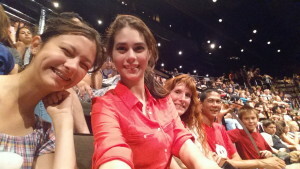 After supper, we went to the Princess Theater for a live song and dance show. In the Princess Theater Waiting for a Show. Click photo for full size. To celebrate our 30th wedding anniversary, Jeri and I (Tim) took our first cruise thanks to our loving, generous children (especially the ones with jobs). Justin and Josiah dropped us off in Long Beach (about a 30-minute drive from home) on Wednesday, September 23rd. 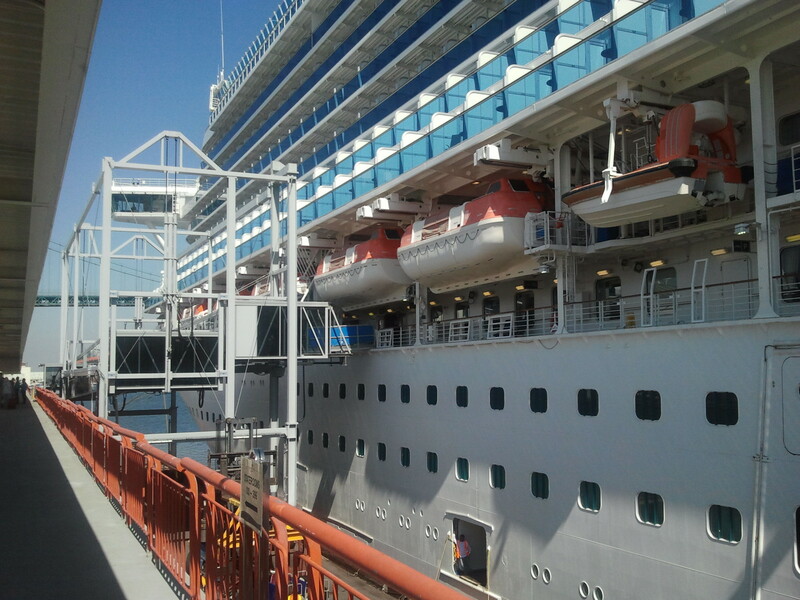 We sailed on the Crown Princess along with over 3,000 other passengers. While Walking Up to Board the Crown Princess. Click photo for full size. 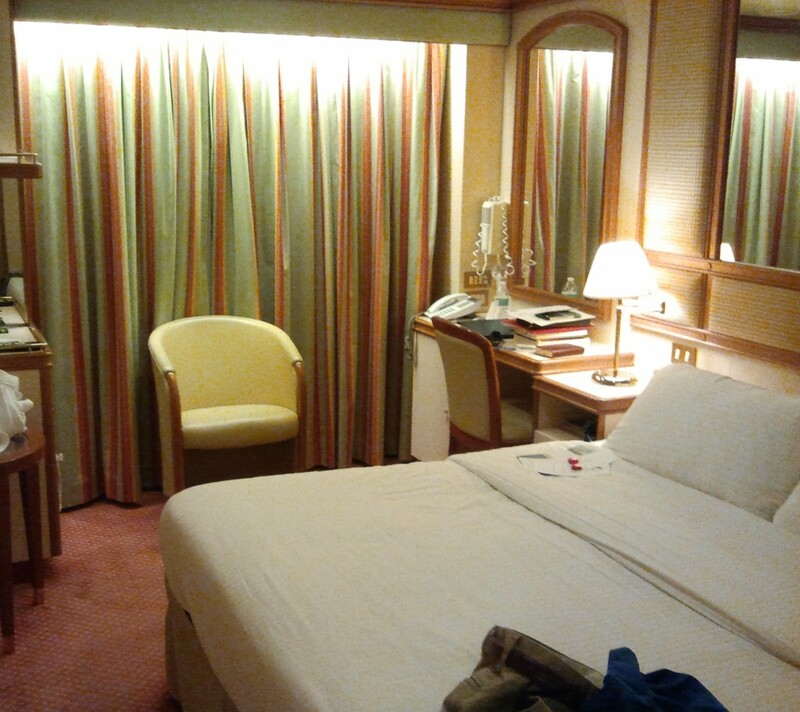 Here’s a picture of our room. 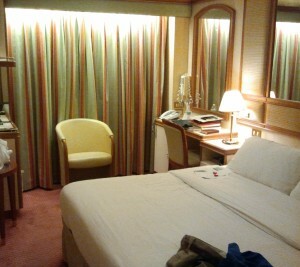 Our Cabin on the Crown Princess. Click photo for full size. 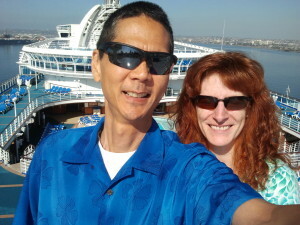 Overnight, we sailed to San Diego which was only a short distance away. 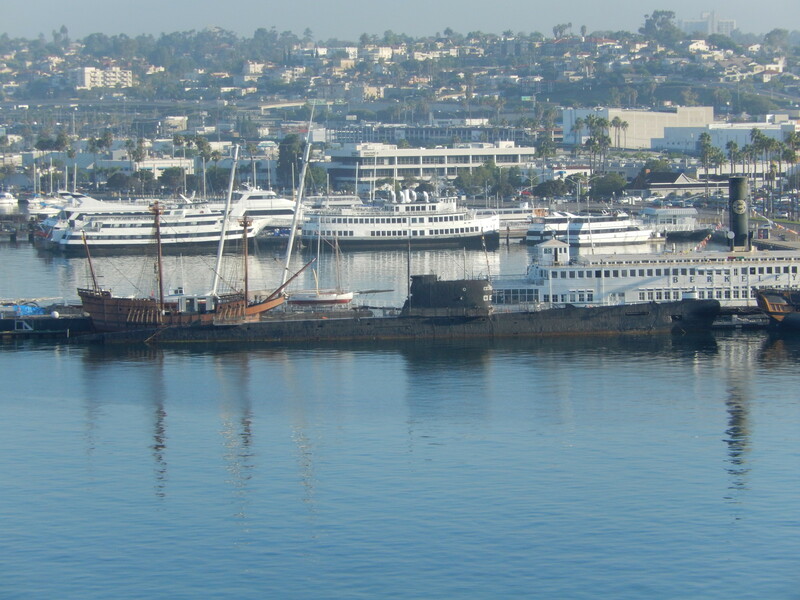 We woke up in San Diego Harbor. Jeri Looking Out from Our Balcony in San Diego. Click photo for full size. Here’s view from our balcony. Note the submarine in the picture. 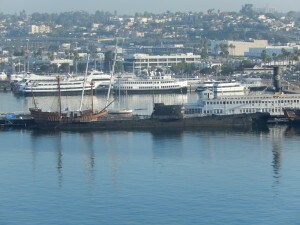 B-39 Submarine in San Diego viewed from our Cruise Ship. Click photo for full size. This morning we went up to the buffet for breakfast. While we were sitting, a couple in their 60s came walking by and sat two tables away from us. She was berating him for not telling her exactly where to find him. Apparently he told her that he would “be outside.” Since the outside eating area is pretty large, she was frustrated that she had to walk around to find him. She slammed her tray on the table and repeatedly told him how wrong he was. He did say that he was sorry but she didn’t accept his apologies. 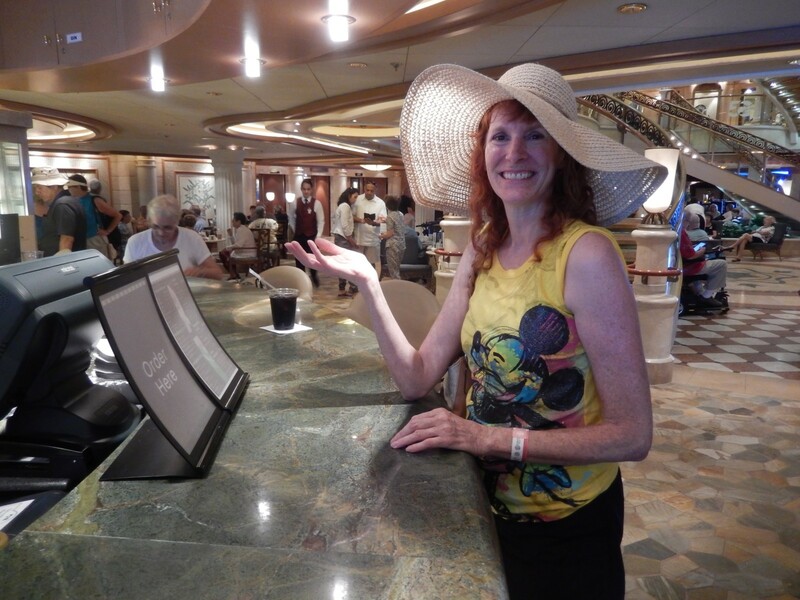 After breakfast, we walked around the ship and explored for a bit. We found the highest deck. 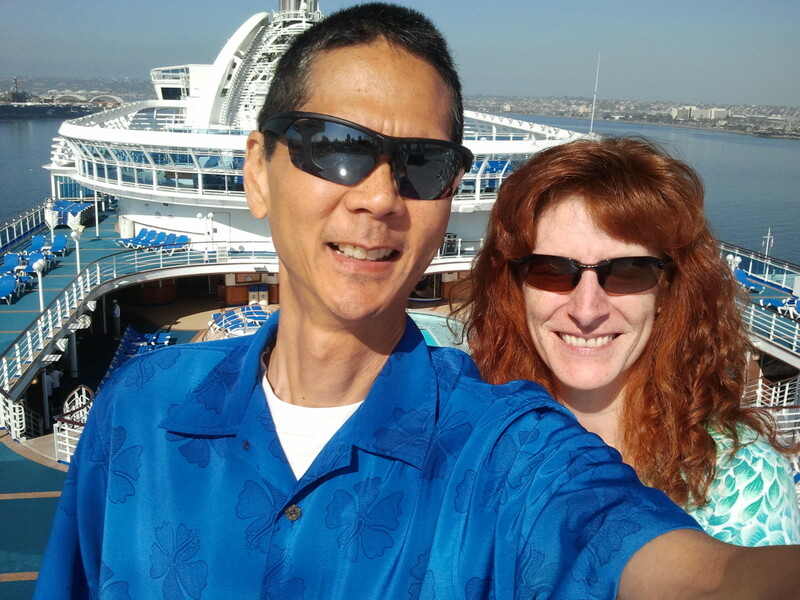 A Selfie on the Topmost Deck of the Crown Princess. Click photo for full size. Jeri woke up with a slight headache. Oftentimes her headaches go away after she gets up. However this one didn’t. So she took a nap most of the afternoon. We turned on the Romance movie channel in our room and we saw the end of a movie “The Fault in Our Stars.” It’s a PG-13 romance drama about two cancer-stricken teenagers. Tim had to eat lunch by himself…definitely not as fun. He even went to the evening show by himself. 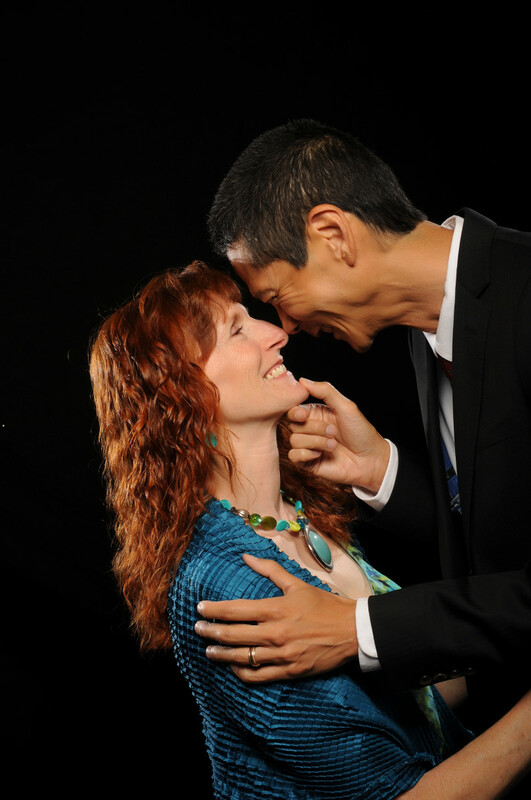 Jay Alexander, the mentalist, did some cool “mind-reading” tricks. Very entertaining. He does a second (different) show later on the cruise as well. Most of the family went to Disneyland on Labor Day this year. Normally our church has a picnic on Memorial Day but canceled this year’s because a lot of people were out of town. We knew that it was going to be hot and busy so we tried to get there when they opened at 8:00. We were in the park (California Adventure) by 8:15 AM. We had fun. We did the rollercoaster (California Screamin’). 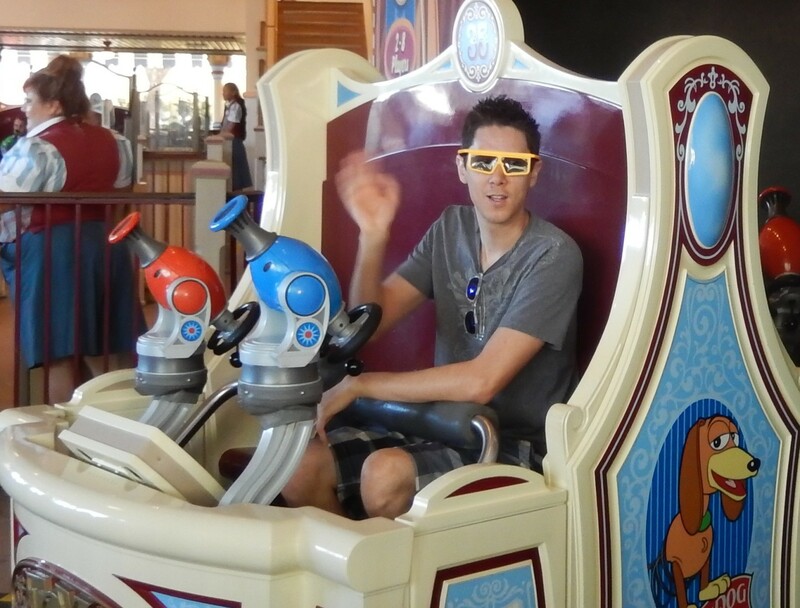 Some did Toy Story Midway Mania; Justin was disappointed that he only had high score of the day and not high score of the month. Some did the Mickey’s Fun Wheel. We all did Grizzly River Run so we could get wet and cool down. Most of us did Soarin’ over California after a Starbucks break. 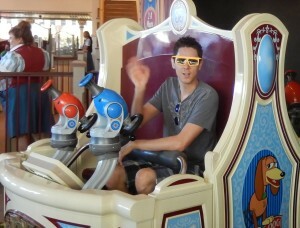 Toy Story Midway Mania is a fun 3-D shooting game. Here’s Justin with the special glasses. Justin Ready to Get High Score of the Day on Midway Mania. Click photo for full size. Victoria got a sweet treat! 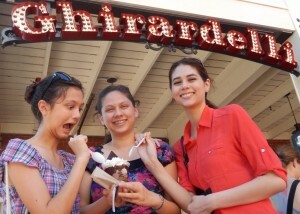 Lizzie, Victoria, and Joanna Outside of Ghirardelli. Click photo for full size. 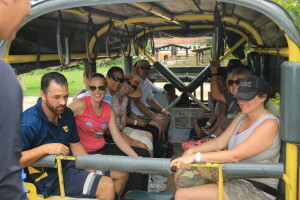 Half of the group went home before lunch (it was getting hot!). The rest of us planned to catch the Alladin show at 12:40 PM. Since we had over an hour before the show, we headed to Disneyland (remember, we were in California Adventure). Unfortunately the lines were long and the Fast Pass return times were late. So we didn’t do anything in Disneyland except get hot. We did stop in the Star Wars store. We found an R2D2 outfit that would only cost over $200! Lizzie with an R2D2 Star Wars outfit. Click photo for full size. Because Josiah needed to replace his pirate sword, we headed to the Pirates of Caribbean area. 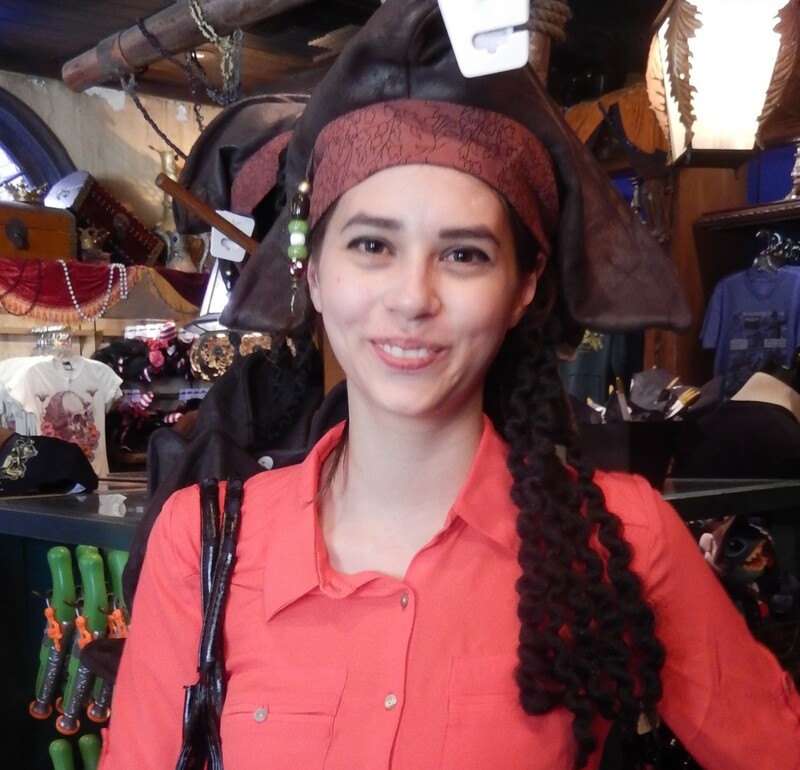 Here’s Joanna as a pirate. Joanna as a Pirate. Click photo for full size. After buying Josiah a sword, we needed to head back for the Aladdin show. We decided to play it “cool” and instead of walk back to the main entrance, we would take the Disneyland train. That was a mistake! Not only did we have to wait in the hot sun for the train but they didn’t have enough room, so we had to wait for the next train. By the time that we got to the gate, it was too late for the Aladdin show. We had to wait until 2:20 PM for the next show. So we stopped for some lunch and then headed to the show. The show was entertaining as always. 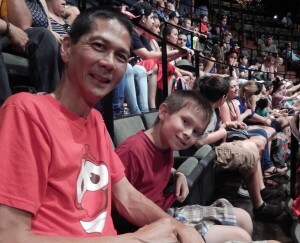 Tim and Josiah at the Aladdin Show. Click photo for full size. 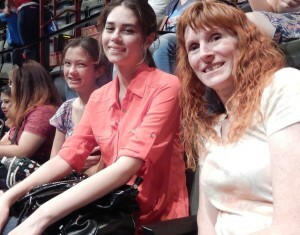 Lizzie, Joanna, and Jeri Ready for the Aladdin Show. Click photo for full size. Joanna took a selfie of our group. Selfie of Lizzie, Joanna, Jeri, Tim, and Josiah at the Aladdin Show. Click photo for full size.